Blogging about books is particularly popular amongst kids – it’s a great way to share your views about books you’ve read with the wider world. And reading kids’ book review blogs is a fantastic way to discover new books to read because you know you’re getting an honest opinion from a young reader like you. Today we have a guest post from 12 year old book blogger Oliver Hill from The Olly Book Blog. He’s got a reading challenge for you – are you bookworm enough to take it? Hi there, my name is Oliver Hill and I’m 12 years old. I run quite a few wikis, websites and blogs; I’m also an admin and editor for some. You might find my name on some little games on Roblox etc. as I code some. My main passion on the web though is for my main blog: The Olly Book Blog, which is just one of the topics that this post shall discuss. The main topic though is reading. Reading is fantastic, reading can take you throughout history, into adventures – wherever you want to go, or whatever you want to be; you can do it in a book. Of course many of you will read on e-readers now such as Kindle or Nook (I do this too!) but it doesn’t matter how you read. Just that you enjoy it. But now sadly many children have turned away from the world of books, to enter the world of gaming, TV and more. This is why it is important that we promote reading, especially in countries where technology is advancing at the speed of sound. There are lots of ways that we already promote reading and writing, such as celebrations like World Book Day. But the biggest problem that I have encountered trying to promote reading, is that children don’t have anything to read, or don’t know what to read. So I set up The Olly Book Blog, where children, tweens and teens, can gather to read reviews on over 100 books and decide what to read next. So I have a challenge for you- On World Book Day on 7th March, don’t go playing on your Xbox or PlayStation, lounging on the sofa watching the TV. Read a book. Enter the fantastic realm of stories. Read a book that captures your attention and satisfies you. Read a good book. To help you find the ideal book for you, please visit The Olly Book Blog as it is there for you to browse through the books I have read since April 2012, and choose one to enjoy. Also on World Book Day in most UK schools you’ll receive a £1 off voucher on any book higher than £2.50 or you can use it to purchase a mini book which can be from lots of bestselling series and authors, such as Alex Scarrow or Antony Horowitz. 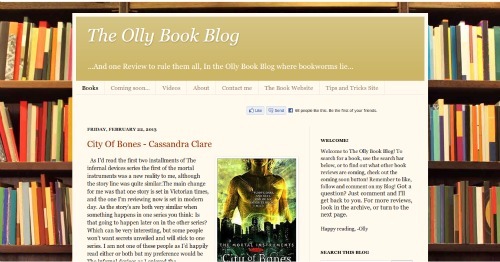 So please, visit the Olly Book Blog and find a book. Let’s find the true magic of stories, and remember also that I will respond to any comment, either on here or on The Olly Book Blog. You can also email me. Or follow me on Google+. Thanks for reading My guest post! We would if we could Olly but I think nominations in the MADs have now closed. Maybe we need awards for kid bloggers? Great to see someone of your age so interested in books, and promoting books over video games. Have a great world book day. good info here. I missed this day but will surely take part in it for 2014.